This talk displaces Hollywood from the landscape of contemporary women’s filmmaking, focusing on the global networks that support and circulate independent and art cinema and on common and contested ways that directors envision space and place in the world. Works by Andrea Arnold, Claire Denis, Guo Xiaolu, So Yong Kim, Shirin Neshat, and Kelly Reichart chart lines of flight across cognitive maps of empire and diaspora. Friday, April 7, 5 p.m. In post-feminist culture, Angela McRobbie asserts, “young women… are the privileged subjects of social change," whether white girls in the Global North or girls as a target of development policy in the Global South. Meanwhile in U.S. educational policy, Kimberlé Crenshaw reports that black girls are “pushed out, overpoliced, and under-protected”. 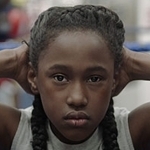 This talk questions the fit between neoliberal ideologies of girlhood and depictions of young black female embodiment in independent film, primarily through a reading of The Fits (Anne Rose Holmer, 2016), which juxtaposes mass psychogenic illness (contagious bodily symptoms) and the discipline of drill team dance. Patricia White is Eugene Lang Research Professor of Film and Media Studies and Coordinator of Gender and Sexuality Studies at Swarthmore College. She is the author of Women’s Cinema/World Cinema: Projecting Contemporary Feminisms (Duke University Press 2015) and Uninvited: Classical Hollywood Cinema and Lesbian Representability (Indiana University Press 1999). Her work in feminist and queer film studies has been published in Camera Obscura, Cinema Journal, Film Quarterly, GLQ, Screen and in the edited collections Indie Reframed, Out in Culture, and A Feminist Reader in Early Cinema, among others. She is co-author with Timothy Corrigan of The Film Experience (Bedford St. Martins, 5th ed. Forthcoming 2017) and co-editor, with Corrigan and Meta Mazaj, of Critical Visions in Film Theory (Bedford St. Martins, 2011). White serves on the board of the non-profit feminist media arts organization Women Make Movies, the advisory board of Film Quarterly, and the editorial collective of the feminist film journal Camera Obscura, for which she coordinates the book series.